In most cases an option pool is set up when a venture capital investor participates in a company. It is usually a requirement of the investor based on a strong belief that the company’s employees will work harder and be stronger committed if they share in the profits of a future exit. Most founders feel the exact same. They see the need for offering options to attract skilful people, knowing that they will never be able to match the salaries that big corporates pay. The answer is: it depends who you ask. If you would ask a US venture capital investor he will most likely say that the option pool should come from the founders’ stake. If you would ask EU continental investors their views will be mixed and more nuanced. If you would ask a founder, don’t matter where, he will most likely be amazed if being told that the option pool will only dilute his equity stake in the company and not that of the investor who insisted on having one. In my view, it’s all a matter of valuation and fair negotiations. As long as all parties involved are clear about their intentions and know how it works, you will come to a fair deal or not a deal at all. Let’s assume a startup raises 1 million euro venture capital financing at a pre-money valuation of 3 million euro on a fully diluted basis. The investor requires a 20% option pool, which is accepted by the founder. For the sake of simplicity, there are no other shareholders. The share capital pre-closing consists of 750,000 shares. The investor calculates that to have a 20% post-closing option pool, 272,727 shares need to be reserved for employees. To give the investor a 25% post-closing stake, 340,909 shares need to be issued to him. The issue price will be € 2.93. This means an effective pre-money valuation of € 2.200.001 (being 750,000 x 2.93) instead of € 3.000.000! 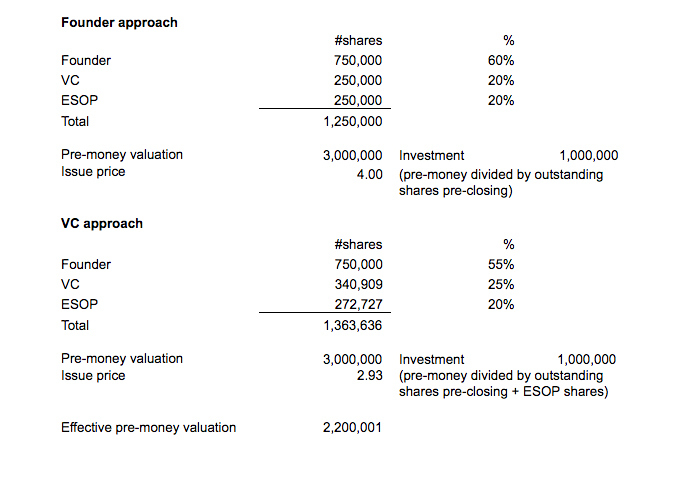 The investor ends up with a stake of 25%, the ESOP (employee stock ownership plan) 20% and the founder 55%. In the example given, the investor and founder agreed on a pre-money valuation of 3 million euro on a fully diluted basis. In fact the misunderstanding comes for a great part from the term on a fully diluted basis. On a fully diluted basis means that the investor’s valuation assumes all options, warrants, convertible debt or other rights to purchase shares in the company, being exercised. There is no discussion between founder and investor on this part of the definition. Since in the example given, no options, warrants, etc. were outstanding, this was no issue. If it is agreed between parties that the option pool is in the pre-money valuation (or in other words: it is agreed that on a fully diluted basis includes the to be agreed upon ESOP), the investor could be incentivized to have a larger than necessary option pool, since it reduces the effective valuation. This is particularly true when taking into account that the full option pool goes into the pre-money valuation, while in the beginning usually only a small percentage of it has been issued and vested. If the company is sold, all un-issued and un-vested options will be cancelled, which benefits all shareholders proportionally even though the option pool has been paid for by the founders only. Of course you could work around this and agree that the underlying shares of any un-issued or un-vested options will be transferred to the founder, but this could make the founder reluctant with actual issuing the options of the agreed ESOP, which is clearly not what the investor wants. Sjoerd Mol is attorney-at-law at Benvalor (mol@benvalor.com). The employee stock option pool and all other commonly used venture capital deal terms are set out in the book Venture Capital Deal Terms, a guide to negotiating and structuring venture capital transactions, by Harm F. de Vries, Menno J. van Loon and Sjoerd Mol (2016), which can be ordered here. This blogpost appeared first on www.venturecapitaldealterms.com.